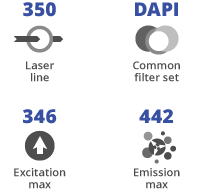 6,8-Difluoro-7-hydroxy-4-methylcoumarin NHS Ester (Marina Blue® NHS Ester) exhibit bright blue fluorescence emission near 460 nm is optimally excited by the intense 365 nm spectra line of the mercury-arc lamp and detect optimally with DAPI optical filter sets. Because the pKa value of 6,8-Difluoro-7-hydroxy-4-methylcoumarin derivatives are 2-3 log units lower compared to those of the corresponding 7-hydroxycoumarin conjugates, 6,8-Difluoro-7-hydroxy-4-methylcoumarin conjugates are strongly fluorescent even at neutral pH. 6,8-Difluoro-7-hydroxy-4-methylcoumarin NHS Ester reacts specifically and efficiently with a primary amine (e.g., side chain of lysine residues or aminosilane-coated surfaces) at pH 7-9 to form a stable, covalent amide bond. The NHS ester (or succinimidyl ester) is the most popular tool for conjugating dyes to the primary amines of protein or antibody (Lys), amine-modified oligonucleotides, and other amine-containing molecules. 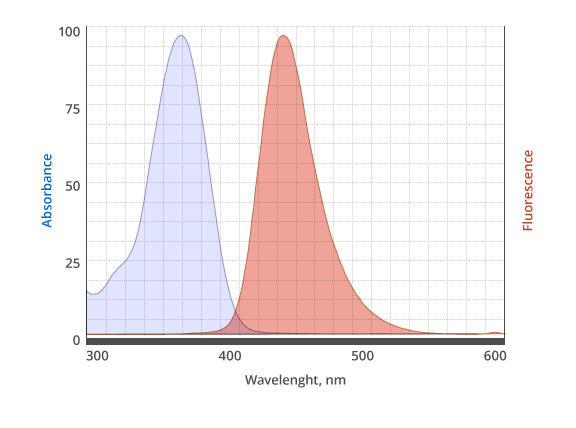 Clcik the link to see more of our classic fluorescent dyes. Marina Blue® Dyes is a registered trademark of Invitrogen, part of Thermo Fisher Scientific. Fluoroprobes is not affiliated with or endorsed by Thermo Fisher Scientific.